It used to be the drinks of artists as Degas and van Gogh, Rimbaud and Verlaine. Absinthe, or le fée verte was served in the most bohemian circles, as well as among common people. This spirit had a high alcohol content and was flavoured with herbs as anise and artimisia absinthium (wormwood). Thus it was diluted with water and added a cube of sugar to sweeten it up. The wormwood was said to create hallucinations. In fact the taste is rather like Pernod, but much more bitter, and in fact Pernod produced large quantities of absinthe until it was banned. 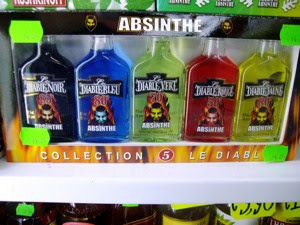 Absinthe became such a problem, that it was banned in most countries early in the 20th century. It started in 1905, when a Swiss man named Jean Lanfray murdered his family and attempted to kill himself after drinking absinthe and the murders were blamed solely on absinthe. The Lanfray murders were the last straw, and a petition to ban absinthe in Switzerland was quickly signed by over 82,000 people. Other countries followed. Well - it is back, and the fairy has different colored devils, all highly alcoholic. From the Diable Noir with as much as 85% to the Diable Rouge with an alcohol content of only 50%. These bottles were for sale in a shop in Barri Gothic. Well for us it can stay there. Importing liquor containing more than 60% to Norway is strictly forbidden. In fact these bottles would be regarded as drugs and you would be treated accordingly by customs and police.